Central question: Are 184 suicide notes too many or too few? Following Jonathan’s death, his estranged brother, Robert Bender, has collected the letters and organized them into a sequence roughly following the chron ology of Jonathan’s life, from his conception, in 1966, to his death, in 1999. As the book unfolds, Robert introduces supplementary documents, including footnotes from Robert himself, reports from psychologists, pages from their mother’s old diary, transcripts from a conversation between Robert and their father, and the sort of ephemera that might follow anyone through life: articles torn from newspapers, possibly meaningful jottings from school notebooks, a mix-tape playlist, a dashed-off roster of possible college majors. Using these and other sources, Kimball creates a sort of curatorial masterpiece, finding the perfect spot for everything that a life comprises. One note filed under the year 1970, when Jonathan would have been three years old, reads in its entirety: “Dear Mom and Dad, Here’s the reason that I pulled the stitching out of my feather pillow and then pulled all of the feathers out of it too: I thought that I was going to find a bird.” Jonathan’s letters aren’t written out of self-pity or rage. Instead, he seems to look back on his life with bemused amazement, as if the whole thing were nothing more than a terrible misunderstanding, as if he should never have been in the world to begin with. The story that emerges is far more complex than a simple examination of a quirky individual gone off the rails or the dreary history of a chronically depressed man, or even of a guy predisposed to mental illness. It is also—and perhaps most tellingly—the chronicle of a man who was raised by people who should never have had children—or siblings, for that matter. 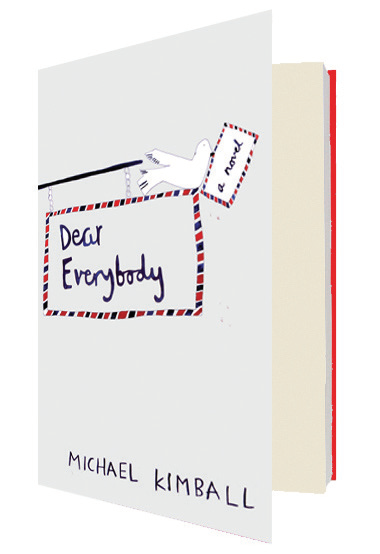 In his later years, Jonathan marries Sara, the indisputable love of his life, to whom many of the letters in Dear Everybody are addressed. Her revealing and poignant eulogy is quoted repeatedly and at length to beautiful effect. As Dear Everybody draws to a close, the letters and accompanying texts become progressively more intense and unexpected, and Jonathan’s illness peaks as he comes to believe that he can control the weather. Though the closing pages are far from cheery, the final power of Dear Everybody is that the reader shares in the inevitably conflicted feelings of those closest to Jonathan— his ex-wife, brother, and mother. It’s sad to see him go, but there is genuine relief in his getaway. It isn’t such a bad fate, after all, once you know the whole story. Drew Nellins lives in Austin, Texas.